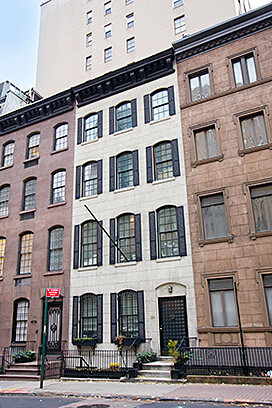 Called a “jewel box” by The New York Times, this 20′-wide, single-family townhouse is a must-see. Enjoy 2400 square feet of living, plus 800 square feet of outdoor space on a quiet block only a brisk walk from midtown. Located on an elegant Murray Hill Historic District block, this 20’ wide, box-shaped single family home has a rare architectural footprint. The exterior is Second Empire style with an English basement and a stucco façade. Its square jewel box layout is both inviting and unpretentious. Original details, wall and ceiling ornaments, and working fireplaces decorate almost every room. Recent renovations include a new kitchen with state-of-the-art appliances, refinished floors and woodwork, complete repainting, new windows, and remodeled bathrooms.